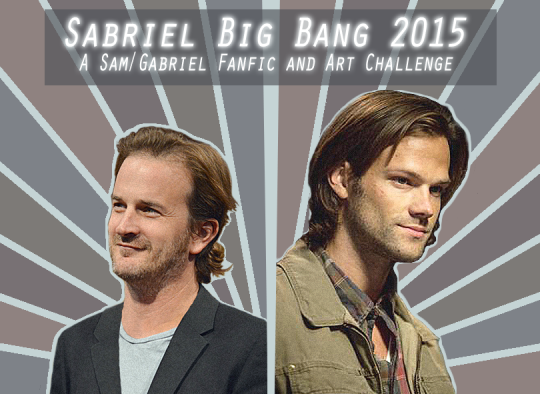 Welcome to the 2015 Sabriel Big Bang, a fanfic and fanart challenge featuring the relationship between any combination of Sam Winchester and Gabriel of the TV show Supernatural, and/or Jared Padalecki and Richard Speight Jr., the actors who portray them! We’re putting a call out to the fandom for writers, artists, and beta readers to make this big bang/mini bang challenge a success! For those who either can’t or don’t want to participate as writers or artists, but still want to contribute, we need cheerleaders! Your encouraging words might make the difference for a writer or artist having a difficult time! And please help us signal boost this to reach as many as possible!